Microsoft has announced the Xbox Games with Gold lineup for February 2019. Starting February 1 to 28 on Xbox One, members can download Bloodstained: Curse of the Moon. This action-adventure title harkens back to some of the classic side-scrolling games of the past. Switch your play among several different characters, each with their own unique abilities, as you travel perilous lands to defeat the evil demon lurking in the forbidden castle. Then, from February 16 to March 15 on Xbox One, members get Super Bomberman R. Guide the Bomberman around a maze-like play area using timed bombs to open walkways and take out players or CPU-controlled adversaries within a timed session. 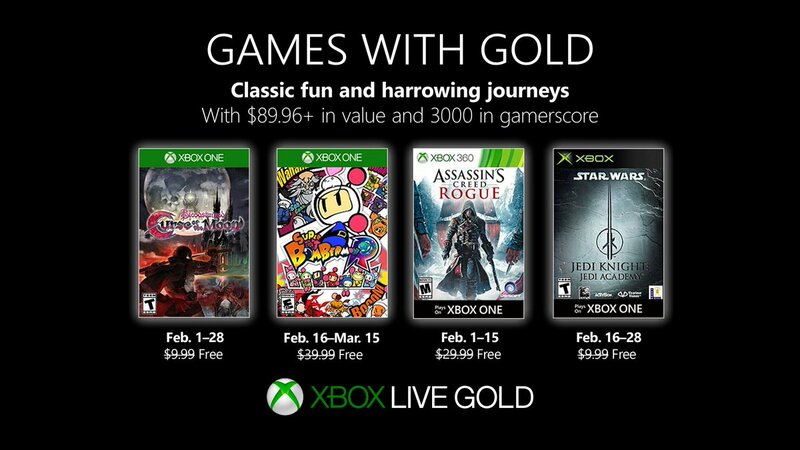 Meanwhile, On Xbox 360 (and Xbox One via Backward Compatibility), from February 1 to 15 members get Assassin's Creed: Rogue. Set in the middle of the 18th century during the Seven Years War, Rogue gives players new locations across North America to explore, including the frozen North Atlantic, the Appalachian River Valley and New York. And later, from February 16 to 28, Xbox 360 and Xbox One members can get Star Wars Jedi Knight: Jedi Academy. Learn the ways of the Force from Jedi Master Luke Skywalker, and begin your journey as a student eager to learn as you interact with famous Star Wars characters and locations.